Sata Misaki – Kagoshima – Nagasaki – Kōzakihana. 佐多岬 – 鹿児島市 – 長崎市 – 神崎鼻(九州最西端). Tuesday 22nd May. (continued) The start of the big bike ride is on foot for the first kilometre or so to the car park. Back at the bikes two ladies approach and ask us what we are doing. So do I! Kawano-san explains and they want our photos, sure. Decide to call my bike “Shinkansen”. Photo opportunity at the start. Didn’t see any monkeys this time but there was a snake that retreated into the roadside bushes as I came past. Pick up our gear from the hotel and continue north. The hills are steeper to go up on this side. If I make it through to the end I’m going to be either very strong or very dead! Does that make sense? It is a bit early to stop when we arrive at Najime Road Station but the last ferry has gone already. Ask to stay in the bungalow but the manager is new and doesn’t believe there is a special ¥2100 rider’s rate instead of the regular ¥6300. When we find the promotional material he says we are not riders, I have to explain “riders” mean people travelling without roof, which includes cyclists as well as motor cyclists. He doesn’t believe me so I say call the boss. He does, I am right. When it comes to showers he says there is a extra fee. He doesn’t give up. Kawano-san had his shower without problem but when I try, the boiler has been turned off, there must be a master switch down in the office. Go to the ladies bathroom and find it still works so use that. We are the only ones there. We didn’t pay the extra shower fee. Discover my cell phone doesn’t work, looks serious. Nice sunset from Najime with Kaimondake to the left. Wednesday 23rd May. 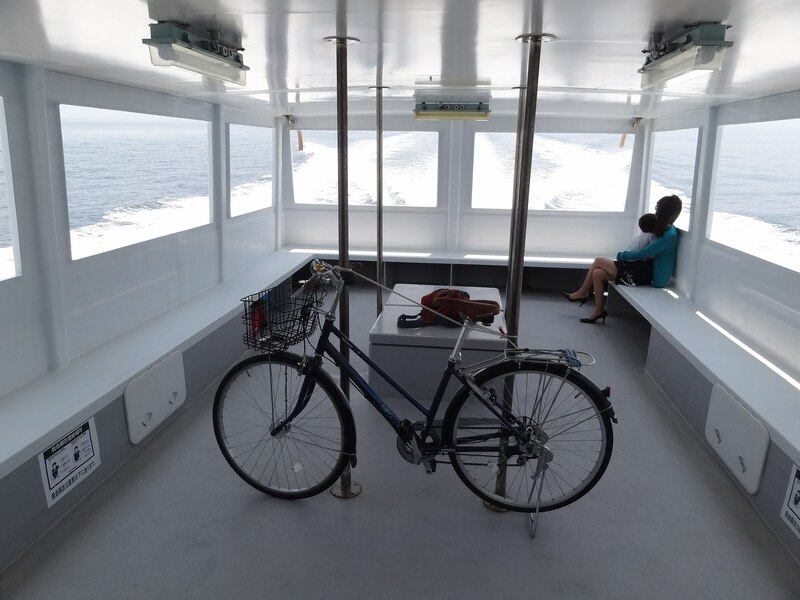 Cross to Yamagawa on the 9:00am ferry. Linger around Ibusuki and check out the sand baths. After lunch head south, go try out the quieter of the two sand bathing locations. It is an interesting experience, being covered almost totally in hot black sand. It felt what it must be like being the main dish at a hangi! A bit like Hot Water Beach on steroids! 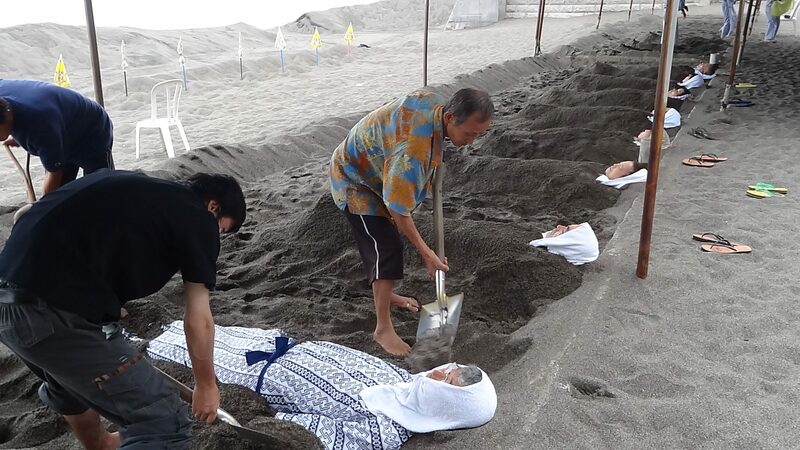 Being prepared for a Japanese-style hangi, hot sand bathing. 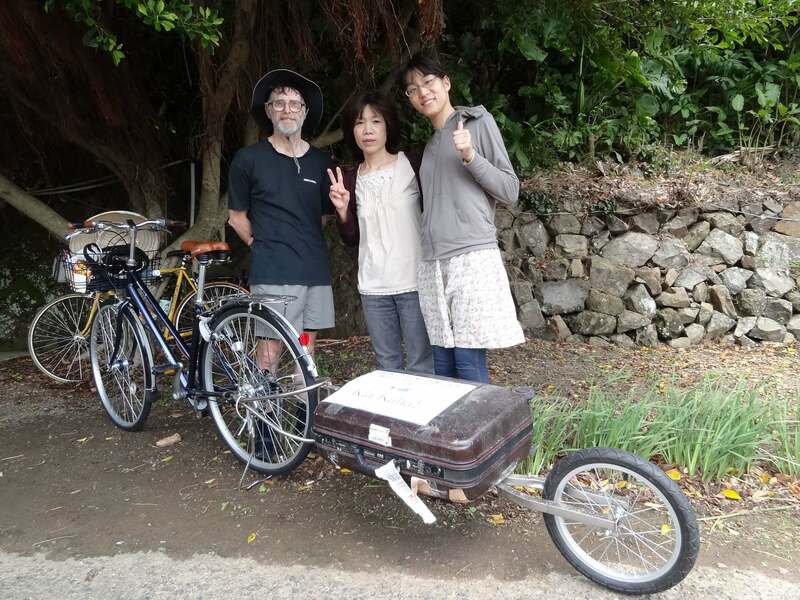 After bathing go to the Kaimon Community Campground. 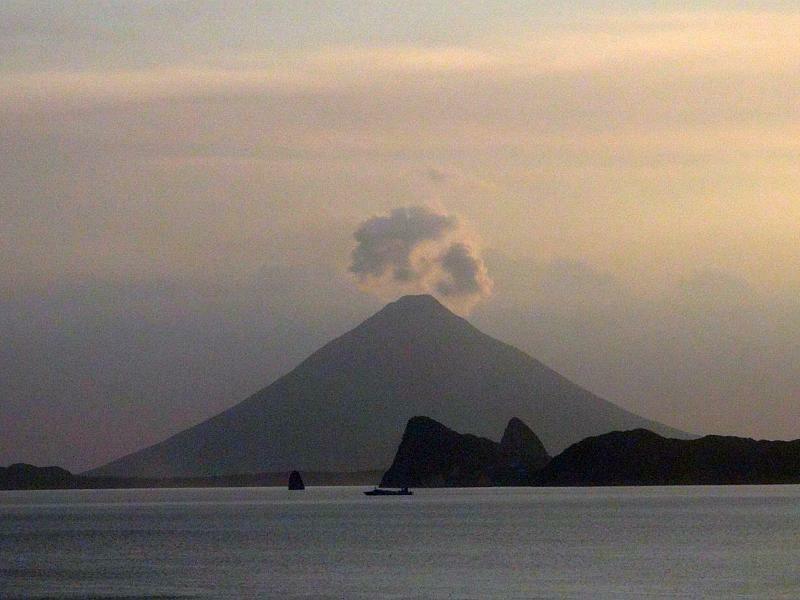 Kaimondake is the mountain with distinct volcanic shape visible from all around the district. Another big climb to the campground. Bungalow ¥2000 each with sheets. During the night I am woken by an itchy cheek, I move to scratch it and touch a foreign body! Whatever it was it bit my finger. I sleep on the floor rather than share a bed with something I don’t know. Thursday 24th May. 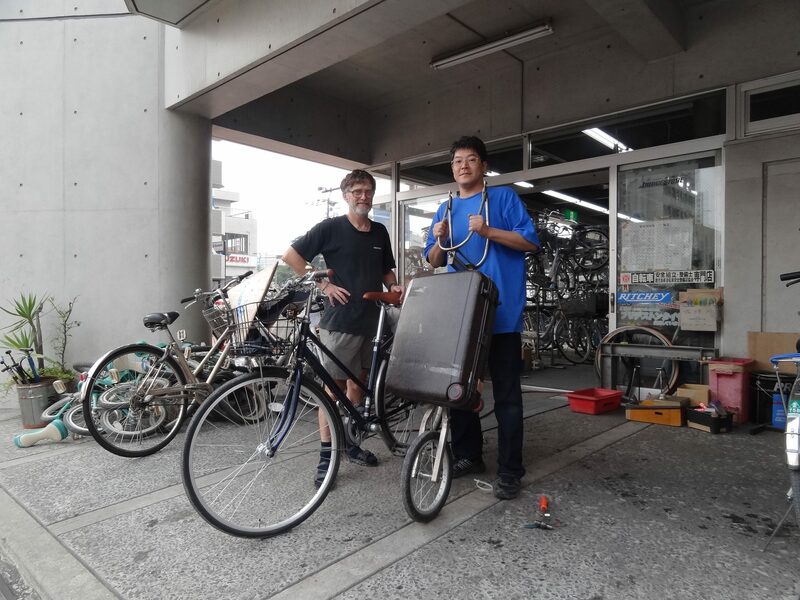 Today Kawano-san departs for home before heading off to Germany, Spain and Italy for more cycle touring. Quite a fellow at 72! I very much appreciate his help and may not have got this far without him. About 5km later stopped by the police. My turn right maneuvers are unlawful – taking the right lane and behaving like a car driver. I must use the hook turn of pedestrians, meaning it takes much longer to do it. I don’t argue. Apart from that we have a pleasant exchange, the policeman spent 4 years in Palmerston North as a schoolboy. His English is very good. 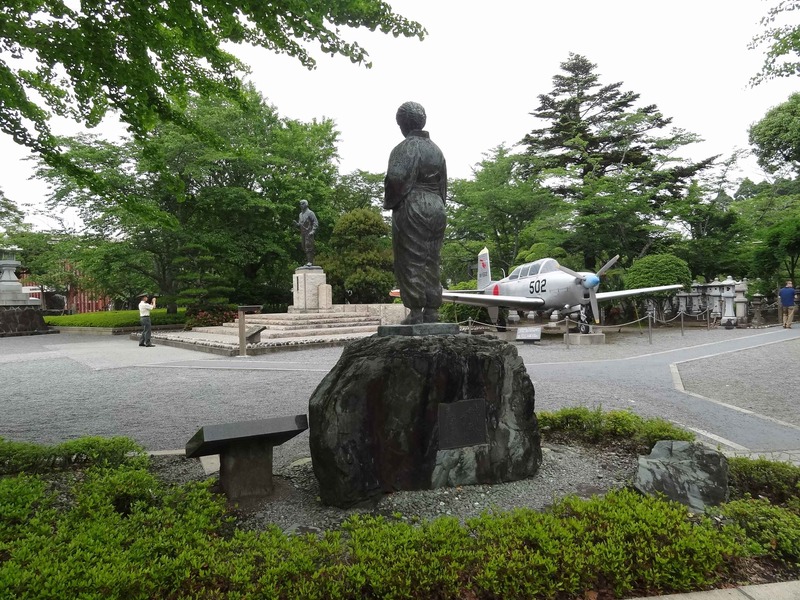 Head up to Chiran, the largest Kamikaze airbase in southern Kyushu. There is a museum dedicated to the pilots and the planes they flew. It saddens me to see so many young men, many under 20 years old, sent on a once only mission, and never to return. Over 1,000 pilots died this way in the Battle of Okinawa. Statue of mother watching her son in background prepare to depart on his one and only mission. It was surprising to see so many people there as the road up had been deserted. I wonder what the grey-haired man was telling all the school children. Chiran also has historical samurai houses but didn’t go to see them. Head back to Kagoshima with a lovely long descent about half way there. Make it to the guest house in good time. My things stored in the smoking room haven’t disappeared. Go to the bike shop to see if I can get some changes to the bike but it is not possible. But he agrees to take the trailer! I don’t think I could have managed to go up the steeper hills with it and all my gear. I hope everything will fit into what is left. Back at the bike shop, saying bye-bye to the trailer. Friday 25th May. Manage to fit everything in with room to spare. An Australian staying at Little Asia on a visit to see his son is highly amused by my project. Gentle drizzle almost all day. Follow the same route as last year. Prefecture Road 24 is good, but most of Route 3 is unpleasant, gentle rain for most of the ride. Feels like the Land of the Long Dark Cloud! Once again I have the sleeping compartment at Akune Rider House all to myself. The owner is very happy when I buy curry and rice for tea, I think business is slow in their cafe. Saturday 26th May. This morning is the first in almost two weeks I have spent alone. It is like my mood, overcast and it was difficult to get motivated. Eventually get away at 9:30am. Use a minor road and pass through some tiny settlements. Interesting. The hills are steep though! Some things you pass on your way. Thought I was late for the ferry to Amakusa Island but instead was 20 mins early. 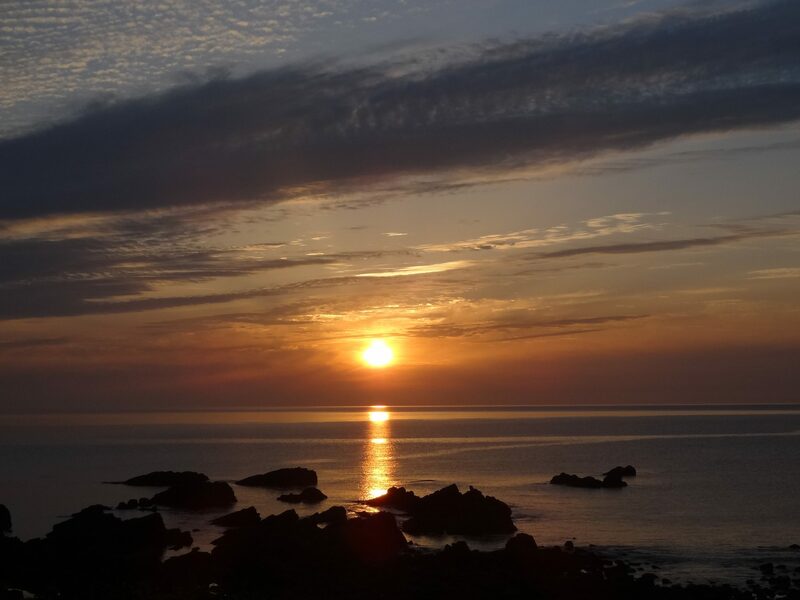 Decide to go directly to Fuuraibou Backpackers up the coast rather than hang around Ushibuka. Arrive at Oe at 5:00pm just as the church closes. Make it to Fuuraibou OK, Tatsu is there, he still listens to Auckland’s Breeze FM from his time in New Zealand. He enjoyed using the BBH (Budget Backpacker Hostels) system of hostels so much he replicated it here in Japan. Like last night, I am the only guest. Beautiful sunset, best so far. Just as previously, when I get in front of a computer I cannot stay awake. Several times feel I am falling over but manage to avoid banging my head against the computer screen before giving up and going to bed. Sunday 27th May. 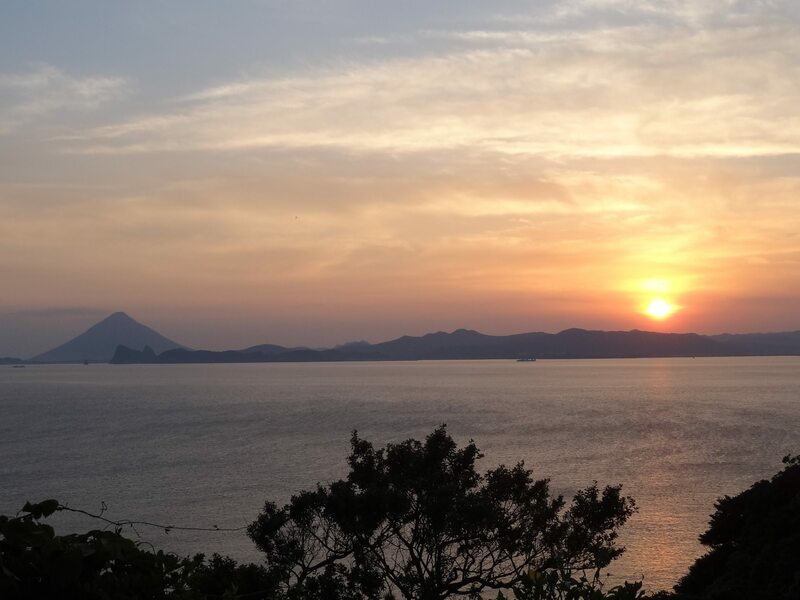 A lovely day dawns, a fairly easy day to Nagasaki, there is a “new” ferry from Amakusa, takes 45 mins instead of 70, at ¥2000 per person it costs 4 times more than the previous one. Bike is a huge ¥1200! Only 7 people on board. Shinkansen on the “new” ferry to Nagasaki at four times the price. Big hill to go over to Nagasaki, but nice long downhill at the end. Arrive at Akari Guest House early afternoon. I guess arriving at Nagasaki is the first hurdle climbed. Monday 28th May. Afternoon interview with Bryan Crump on National Radio for the Odyssey segment on tomorrow’s night’s programme. Seemed to go alright. 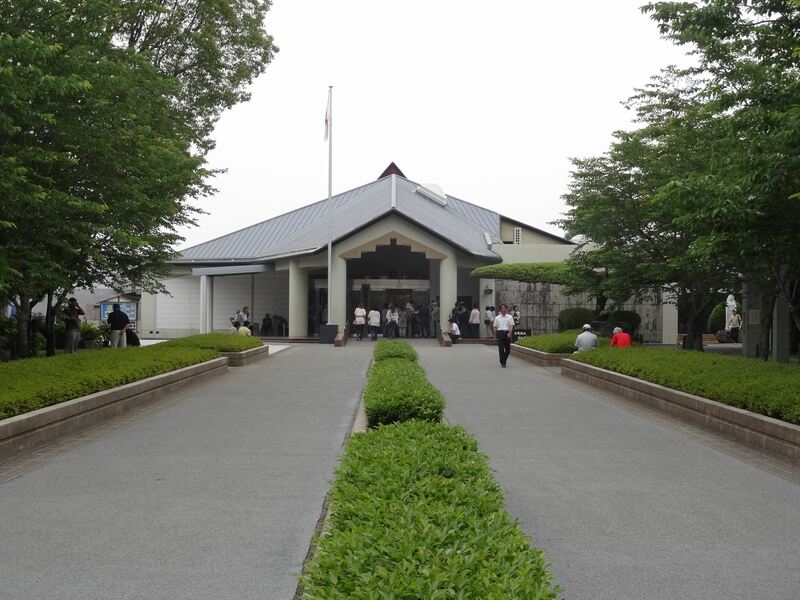 Afterwards go to Peace Park, Urukami Cathedral and Hypocenter Park, all seen last year, plus the Atomic Bomb Museum. Discover a memorial from NZ in Peace Park but bang my head on it while trying to see the inscription. Ouch! Tuesday 29th May. Stay another day in Nagasaki to catch up with admin things still not done. Wednesday 30th May. Morning visit to the panorama lookout in the cemetery behind Shrine St. 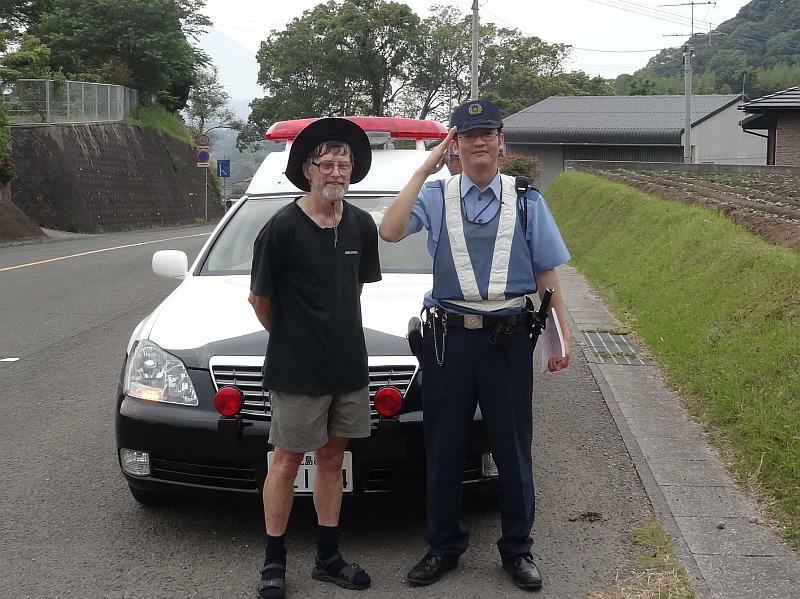 Finally got a Japanese flag to use to try keep car drivers from coming too close. ¥680 was a little more than the ¥100 I wanted to pay. Finally head off to Sasebo in the afternoon. An unmemorable road to ride and busy. Arrive at rider house in good time. On the way stop at Holland Park, a replica Dutch village. This is not to be mistaken for Sasebo’s Huis Ten Bosch. The former was a public owned amusement park until closure about 10 years ago, the latter is private and still operating. Stay in an old campervan. Quite a lot of traffic noise at night due to being close to the roadway. Thursday 31st May. 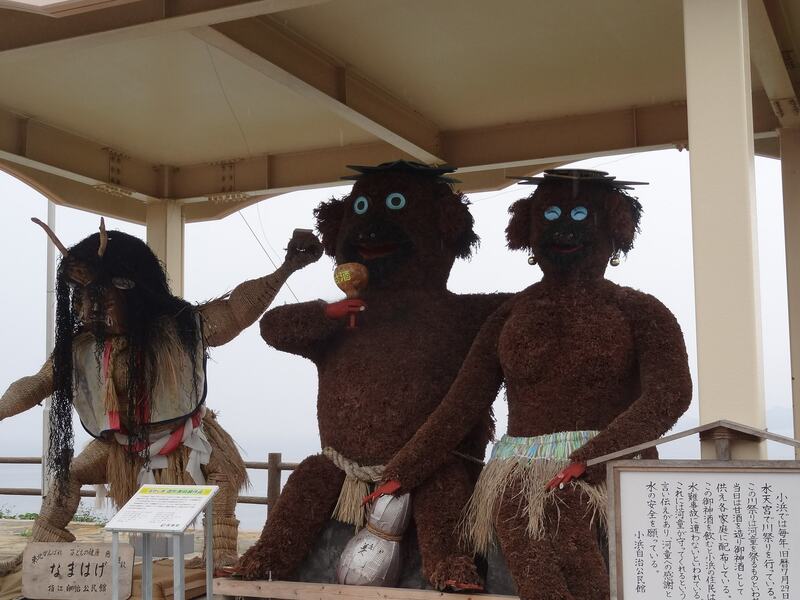 Nice weather so make a day trip to Kōzakihana, an estimated 40km one way. Arrive OK at lunchtime. At the western point of Japan, the wind was soooo strong! 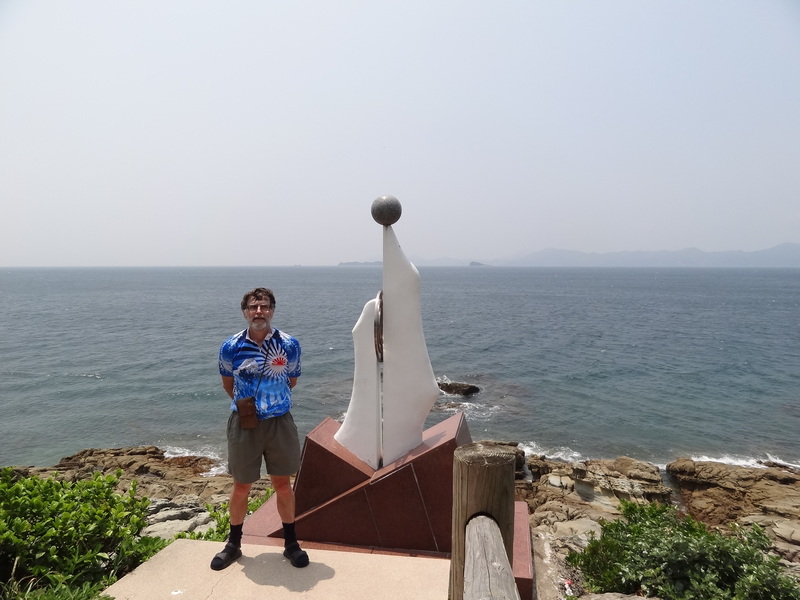 This entry was posted in Cycle Touring, Japan, Kyushu and tagged cycle touring, Japan, Kyushu. Bookmark the permalink. 1 Response to Sata Misaki – Kagoshima – Nagasaki – Kōzakihana.